Check out my friend’s amazing blog of wonderful travel illustrations!! 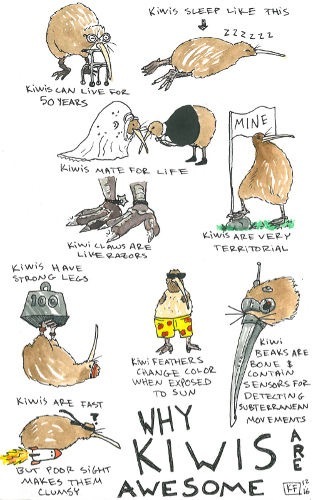 I’ve said it before but I’ll say it again: I love kiwi birds. These creatures are so under appreciated outside of New Zealand, so I made a handy guide showcasing nine things that make kiwis awesome. For more kiwi art check out my posts from Willowbank Park and the Auckland Museum. It’s been about a year and a half since my last blog post, which is absolutely shameful. Much has happened, much has changed, though I’m still living in Machida, Tokyo. I now teach several jobs part-time, teaching university students, junior high school students, and assisting at an English immersion kindergarten. For the first time since college, I work five days a week like a “normal” adult. While I’ve been a night owl since elementary school (according to my mom) and have never gone to bed before midnight unless I was sick, I’ve gotten much better at waking up early for work. I often need to bike to the station. I spend much of my days commuting on trains, during which I try to study for a MA in TESOL from the New School (reading articles or posting on discussion boards), or mark students’ essay drafts without making disgruntled faces. Pretty dry post for now, but it’s 12:40 and I should hit the hay as they say so I’m not a zombie with the kids tomorrow. Speaking of hay, I get to see horses almost every week. That’s new.